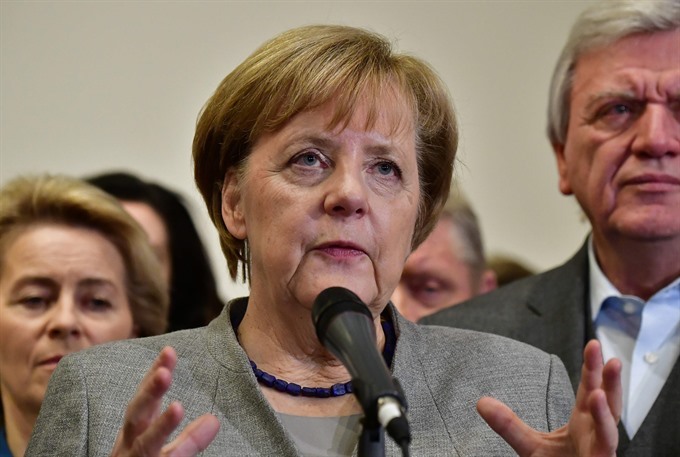 BERLIN — Chancellor Angela Merkel was left battling for political survival on Monday after high-stakes talks to form a new government collapsed – plunging Germany into a crisis that could see it hold fresh elections. Europe’s biggest economy now faces weeks, if not months of paralysis with a lame-duck government that is unlikely to take bold policy action. And with no other viable coalition in sight, Germany may be forced to hold new elections that risk being as inconclusive as September’s polls. Merkel had been forced to seek an alliance with an unlikely group of parties after September’s elections left her without a majority. But after more than a month of gruelling negotiations, the leader of the pro-business FDP, Christian Lindner, walked out of talks, saying there was no "basis of trust" to forge a government with Merkel’s conservative alliance CDU-CSU and ecologist Greens. "It is better not to govern than to govern badly," he said, adding that the parties did not share "a common vision on modernising" Germany. Voicing regret for the FDP’s decision, Merkel vowed to steer Germany through the crisis. The Greens’ leaders also deplored the collapse of talks, saying they had believed a deal could be done despite the differences. Merkel’s liberal refugee policy that let in more than a million asylum seekers since 2015 had also pushed some voters to the far-right AfD, which in September elections campaigned on an Islamophobic and anti-immigration platform. Party chiefs had initially set 6:00 pm (1700 GMT) Sunday as the moment of truth, but the deadline went by without a breakthrough – the second overtime after already missing a previous target on Thursday. But signs that talks were going badly began emerging and Bild daily said on its website that "failure is in the air" as parties dug in their heels on key sticking points. Merkel could now try to convince the Social Democratic Party, which has been junior coalition in her government since 2013, to return to a partnership. But after the SPD suffered a humiliating loss at the polls, the party’s top brass has repeatedly said its place was now in the opposition. Merkel, who has been in power for 12 years, could also lead a minority government although she had signalled that she was not in favour of such instability. Germany could likely therefore be forced to hold new elections. Top-selling Bild daily said earlier Sunday that a failure to forge a tie-up – dubbed a "Jamaica coalition" because the parties’ colours match those of the Jamaican flag – puts "her chancellorship in danger". A poll by Welt online also found that 61.4 per cent of people surveyed said a collapse of talks would mean an end to Merkel as chancellor. Only 31.5 per cent thought otherwise. As coalition talks dragged out without a breakthrough, Germany’s President Frank-Walter Steinmeier issued a warning to parties in the talks. "All sides are aware of their responsibilities. And this responsibility means not returning their mandate to voters," he said in an interview with Weltam Sonntag. Sueddeutsche daily noted that Steinmeier’s warning came because he sees in new elections "the risk that even a bigger coalition or a Jamaica coalition would no longer have a majority".